There has never been a lack of work for foreign architects in Russia. Almost all the buildings in the Moscow Kremlin were built under the supervision of Italian architects. Even the Assumption and Archangel Cathedrals, which are typical examples of Russian church architecture, were built by Italians, not to mention the Kremlin’s towers and palaces. It’s impossible to overestimate the contributions of foreigners to the construction of St. Petersburg’s historic landmarks. And even in the early decades of the Soviet Union, authorities readily cooperated with European architects. But the situation changed dramatically in the 1930s when the country came to rely solely on domestic talent. With the advent of Perestroika, a light breeze from the sea of world architecture began blowing in Russia’s direction, and in the 2000s, a barrage of famous architects attracted to the new undeveloped market hit Russia. However, the expected surge of architectural masterpieces did not follow. Russian realities threw up a host of problems in the way of each new project. The residential complex called Russian Avant-Garde, designed by Dutch architect Erick Van Egeraat, was to be built next to the Park of the Arts. Five colorful towers were to symbolize five Russian avant-garde artists. Everything might have turned out well if former Moscow Mayor Yury Luzhkov had not opined that the project was good, but its location was wrong. No other site for it has been found. British architect Norman Foster has not yet been lucky with a single one of his proposed projects for Russia. His project for developing St. Petersburg’s New Holland Island, which won a contest in 2007 and a prize at an international real estate exhibition in Cannes, never got off the ground because of financial problems. The new developer of the island later announced a new competition. Foster also designed a museum district at the request of the director of the Pushkin Museum of Fine Arts in Moscow. The joint Foster-Tkachenko project won the bidding process for government financing, only to be shelved. And finally, Foster took active part in designing a new residential district in the heart of Moscow to replace the demolished Rossiya Hotel. According to Moscow authorities, Foster’s project was to be adapted to modern Russian conditions by local architects, taking into account the history of the area. The resulting hybrid was never unveiled to the public. 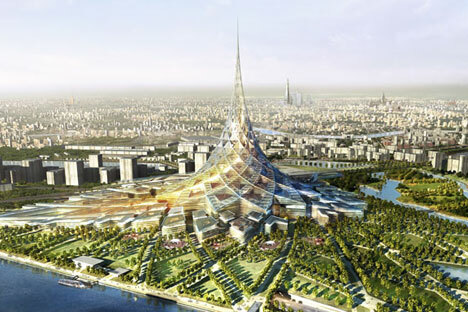 The cultural and business center at Nagatinskaya Poyma in Moscow, proposed by Norman Foster and dubbed the Crystal Island, was to be a futuristic 450-meter tall glass hyperboloid. Construction never got off the ground because problems arose with the customer. A modified version of the project was finally realized in Astana, Kazakhstan. The 600-meter tall Russia Tower designed by Norman Foster’s office at the request of the Mirax Group for Moscow City (Moscow International Business Center) was never realized. Construction was put on hold as the design was changed and the height of the building was reduced. Under new Mayor Sergei Sobyanin, the skyscraper project was scrapped. The 51-storey Paradise Living residential complex with hanging gardens, designed by Japanese architect Kiyonori Kikutake, was to be built on the banks of the Moskva River opposite Moscow City. Its high rises were to echo the Business Center’s skyscrapers, but at the same time offer an architectural contrast. The attractive idea has yet to be realized. The Gazprom Tower in St. Petersburg, designed by British architectural group RMJM London, found little favor with local residents and even UNESCO representatives. Their main objection was that it was too close to the city’s historic center. The customer then chose a new site in the city’s outskirts, but opposition to the tower hardly diminished. British architect Zaha Hadid did several projects for Russia, but, as in Foster’s case, none of them have been implemented. The most realistic of the projects was the Expocentre Exhibition Halls and Residential Tower project submitted in 2006. The Expocentre website claims construction will begin soon, but nothing is happening on the ground. Initially, Erick Van Egeraat was to design the two City of Capitals towers for the Moscow City International Business Center. However, the project was declared too complicated by the Capital Group developer that commissioned it. Without the creator’s consent it was sent to the American architecture firm NBBJ for reworking, which resulted in several rounds of litigation. The Legend of Tsvetnoy residential complex was also commissioned by the Capital Group. German father-and-son architects Günter and Stefan Behnisch worked on it, but it was later sent to NBBJ, which robbed the building of its original elegance by increasing its size and reducing the public spaces. French architect Dominique Perrault won the competition to design a new stage for St. Petersburg's Mariinsky Theater, but the project was then deemed too complicated and expensive. Construction was put on hold and a new tender was announced, only to be won by an even more expensive but less interesting project from Diamond+Schmitt Architects. This tradition of tampering with approved projects was born simultaneously with the emergence of modern Russia. Its first victim was the Spaniard Ricardo Bofill. He was working on what later became known as the Smolensky Mall back in the late 1980s. Russian specialists muscled their way into the project, causing Bofill to renounce his authorship. They seem to be building something, but will it be completed? The tender for the World Mammoth and Permafrost Museum in Yakutia attracted many Western stars, though it went virtually unnoticed in Russia. The winner was Thomas Leeser of the United States. The museum has yet to be built. But then, of course, mammoths frozen in permafrost can wait an eternity. The football stadium on Krestovsky Island in St. Petersburg was designed by Kisho Kurokawa of Japan. He died in 2007, the year that construction began. Construction is still underway. The cost of the project is growing every year at a much faster rate than the stadium itself. Common sense suggests that the design for a new Dynamo stadium, developed by Erick Van Egeraat jointly with Russian architects from Mosproject-2, should be completed in time for the 2018 World Cup. The main objections to the construction were raised by the Architectural Heritage Preservation Society, despite the fact that the architects had decided not to alter the building’s historical façade or the surrounding park. Still, several buildings have appeared in Russia over the last couple of years that keep alive the hope that creations by world architecture stars can survive in this climate. One prominent success story is the Skolkovo management school and campus designed by David Adjaye of Britain. His project won a competition. It took 1,460 days and $250 million to build it. Erick Van Egeraat succeeded where Norman Foster and Zaha Hadid failed. Perhaps the secret of his success is that he aimed not only for the capitals, but also for other regions. The Vershina shopping and entertainment center in Surgut and a chess and billiards club in Khanty-Mansiysk opened almost a year ago. Egeraat has developed more projects for Russia than any of his colleagues. He has an official website in English and Russian (and not in his native Dutch as one might expect). So, his success in Russia is well-justified.